Following an agreement with the Italian company SIAI-Marchetti in 1967, FFA has developed and produced the two/three-seat AS 202 Bravo light trainer and sporting aircraft. First flown in 1969, the bravo is currently available in two versions: AS202/15 powered by a 150hp Lycoming engine, of which some 28 had been delivered by the beginning of 1978; and the AS202/18A powered by a 180hp Lycoming. More than 150 Bravos had been built by 1983. 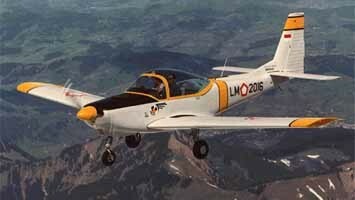 FFA has also flown the prototype of a 260hp Lycoming-engine version, the AS202/26A. Cruising speed of the AS202/15 is about 130mph (210km/hr) and maximum range is 553 miles (890km).